Lyle Johnson remembers how salty he was the first time he had to show up at the St. Croix County jail for a drug test. “If you don’t show up, they’re going to send the posse out after you. I kind of thought you were innocent until proven guilty,” the River Falls man recalled thinking. Though he’d been charged with a drug offense, the notion of pre-conviction requirements nagged at him as he arrived at the jail’s Day Report Center to abide his bond conditions, which include absolute sobriety. But with several months of sobriety now behind him, he said he now sees the sheriff’s office program through a different lens. “It turned out to be a good experience,” Johnson said last week, adding that he’s been off meth since Oct. 29. As the program nears its first anniversary in March, St. Croix County criminal justice officials cited cases like Johnson’s — along with several months’ worth of data — as mounting evidence of success. “It’s very productive,” she said. Between its launch in March 2017 and November, the program saw 8,137 of its 9,160 tests come up free of prohibited substances. Borgschatz said that an 89 percent compliance rate for defendants out on bond represents more than just a figure. “That’s going to have an impact on crime and within families,” she said. The fact that those people are staying clean means they’re not committing crimes to support their habit or harming others while they’re under the influence, Borgschatz explained. Without an accountability system in place, there’s often nothing other than a court order forcing those defendants to comply. According to attorney Liesl Nelson, Hudson Public Defender’s Office attorneys harbor multiple concerns regarding the use of a day report center. Those include questions such as, does increasing the number of bond conditions imposed on defendants achieve public safety enhancement goals? Are individuals connecting to needed services? Are increased conditions beyond the ability of many individuals? Do they lead to increased bail jumping charges and increased incarceration numbers before these individuals have had an opportunity to be heard on their charges? Nelson asked if services are truly being provided to those who need them when they are unable to meet the conditions of bond. What if they don’t have the ability to access those services when ordered to do so? In spite of the 89 percent compliance rate, there are those who aren’t testing clean or don’t show up for their tests. When that happens, those defendants get slapped with bail jumping charges. St. Croix County has seen a sharp increase in bail jumping charges after lodging 706 in 2015 and 643 in 2016. That climbed 61 percent in 2017 to 1,033 bail jumping charges. But Borgschatz and Nieskes said the increase is somewhat misleading. Both officials said it was largely due to a small group of defendants who continued to use while on bond. When test after test on the same person continues to come up dirty, those charges can compound, they explained. “I believe that if the numbers would be examined you would find that a significant portion of the violations are done by a small portion of the individuals, who are chronic offenders who continue to post bond and continue to not test, or test positive, or attempt to beat the tests,” Nieskes said. He said the testing protocols have led to local judges reducing the cash bond amounts keeping defendants behind bars. Defendants are now able to raise those smaller bond amounts faster than in the past, Nieskes said. Borgschatz said the cyclical nature of the continuum speaks to the level of addiction those offenders face. 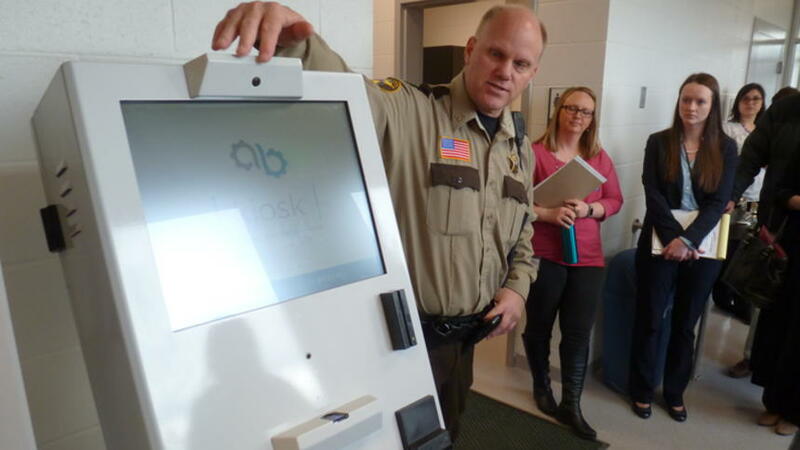 She said programs in jail — St. Croix County offers addiction help for inmates through churches, Narcotics Anonymous, Alcoholics Anonymous and more — or through probation become their best hope. Borgschatz said she only sees the program growing. To that end, she said more deputies will likely be needed to staff the reporting center. The first year revealed the department underestimated staffing levels, which has two deputies dedicated to the program. The department has adapted by reshuffling deputies from other parts of the jail or through overtime. Borgschatz said neither option is optimal — from a staffing or budget standpoint. “We need staffing,” she said. For Johnson, the mandated appointments at the Day Report Center helped him kick his meth habit. “My choices were real limited,” he said. He heaped praise on Day Report Center staff, saying they’re not like other deputies he’s encountered in the past — people who have rubbed his nose in his struggles. “They look at you like a human being,” Johnson said. The angst of mandated preconviction testing ended once he kicked the cravings. “I can understand the flipside of the coin — what’s going on with the other side,” Johnson said. He said he now sees the value in keeping users, especially opioid users, from abuse that leads to overdoses. “I can understand them wanting them to be monitored,” he said.